UNC Family Medicine is committed to pediatric care, from pregnancy on. One way we support our pediatric patients is through our adoption of the Reach out and Read (ROAR) methodology. ROAR is a nonprofit organization that gives young children a foundation for success by incorporating books into pediatric care and encouraging families to read aloud together. They emphasize the importance of reading for early childhood development. The best opportunity to influence a child’s future is in the first five years, a critical window of rapid brain development that does not occur at any other time. Children who hear fewer words during early childhood start school developmentally behind their peers and may never catch up. When families read aloud to their young children, they can give them a better start to life. That’s why our providers give books to children at more than 10 well-child visits from infancy until they start school. More importantly, they encourage families to read aloud and engage with their infants, toddlers and preschoolers every day. Read more about Reach Out and Read here on their website. 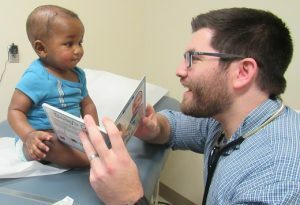 UNC Family Medicine’s Reach Out and Read Program (ROAR) recently received a one year grant from the Strowd Roses, Inc. community grant program for the purchase of children’s books. ROAR is a nonprofit organization that incorporates books into pediatric care and encourages families to read out-loud together. All of the new books that we give to pediatric patients are purchased with funds from generous donors. To make a donation to the Family Medicine Center, select here. Choose the “Family Medicine Fund” and then in the “Tell us a story about why you’re making this gift” section, let us know that you want to support our Reach Out and Read efforts.